A raccoon was to blame for an outage at the West Hills substation that caused more than 40,000 people to lose power early Thursday morning. 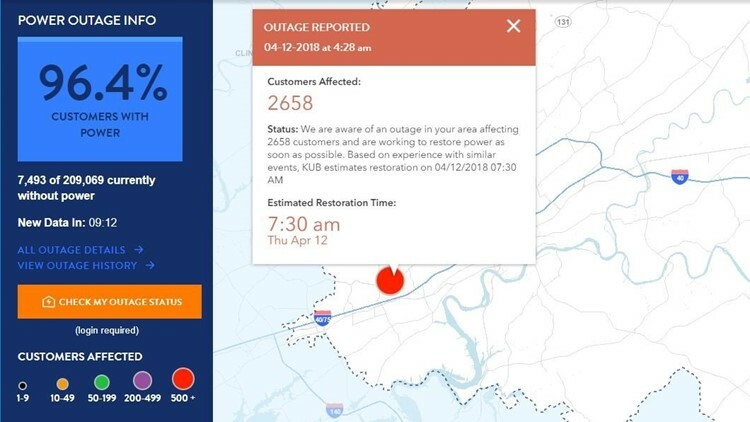 The Knoxville Utilities Board said it has restored power in West Knoxville this morning after one of its substations went down, resulting in more than 40,000 people losing electricity. According to KUB, its West Hills substation had its incoming power feed cut off by a raccoon that found its way onto a main line -- resulting in the massive outage. KUB said more than 40,000 lost power initially around 4 a.m., but it was able to reroute power for most people to reduce the number of outages until crews could restore the substation's main feed around 6:30 a.m.
As one would likely suspect, the raccoon did not survive coming in contact with the substation's main power feed. Video tweeted by KUB below shows the moment the substation went down (and the moment the poor creature likely met its unwitting demise), but thankfully all that's visible is a massive explosion of light from the substation followed by darkness. This isn't the first time a critter has knocked out the West Hills substation. Back in November 2012, a squirrel crawled onto one of the main power lines there and shut power off in the area, which led to several evening wrecks on Middlebrook Pike.